Local author, Clayhanger Kid and friend of the blog Brian Stringer got in touch last week with an interesting bit of ephemera relating to the Pier Hotel, the long-lost pub that used to stand at the end of Pier Street in Brownhills, in an area once known as Pike Helve. I’ve mentioned the boozer before here, in one of my earliest posts. The Fortunes of War/The Pier Hotel/Inn in it’s final days. From the wonderful book ‘Memories of Brownhills Past’ by Clarice Mayo and Geoff harrington. Some of your older blog readers may be interested in this letter I came across when doing some research for my next book. I spoke to Billy Horobin who as a child lived along the spot path, and he told me that he heard somewhere that the Pub at the bottom of Pier St known as the Pier Hotel was once called the FORTUNE OF WAR. Looking through some papers I came across this and thought you might be interested. Thanks are in order to Mr H Williams. I can’t make out the name of Ind Coopes District manager. Image courtesy of Brian Stinger. Click for a larger version. THE CLAYHANGER KID – Will there be a Volume 2 ? It may depend on YOU! ‘I NEVER realised, when I wrote my first book The Clayhanger Kid, the impact it would have on many readers. To me Clayhanger was always a wonderful place for children to grow up, despite the few photographs taken in my day showing a grim and flooded landscape dominated by pit mounds and a refuse tip. To me and the rest of my peers the reality was very different, with an abundance of positive features. Our own school, church, chapel, farm, three shops, pub, thriving workingmen’s club and our own bobby, with the icing on the cake being one of the best parks in the area. Our three streets were surrounded by a large triangle of railways plus a canal on two sides. Each street was backed by acres of fields, both farmed, open wetland or common. It was only through talking to readers of my book, that I began to sense the depth of feeling for the old place and the reverence it still held in their hearts. Someone told me that, given the chance, they would choose to be buried there because they would be back home. No one derides it, only related fond memories, and all agreed that it was a unique and special place. I knew then I had to do a sequel, still about Clayhanger but this time not all about me, but through the eyes of others. I could even cover teenage years and spread farther afield as long as we didn’t stray too far and kept to those times. This entry was posted in Brownhills stuff, Clayhanger stuff, Environment, Events, Followups, Fun stuff to see and do, Interesting photos, Local Blogs, Local History, Local media, News, Reader enquiries, Shared media, Shared memories, Social Media, Spotted whilst browsing the web, Walsall community, Walsall Wood stuff and tagged Brian Stringer, Brownhills, Brownhills local history, Canal, Clayhanger, Clayhanger Kid, Derelict, Fortune of War, H Williams, Horobin, Hotel, Ind Coope, Inn, local blogs, Local History, New Photos, Pier, Pike Helve, Pubs, Redevelopment, Staffordshire. Bookmark the permalink. On the 23rd of September Beatrice Lamb, daughter of landlord of Pier Hotel, and Emma Adams were standing on the canal bridge. Elijah Heath was a short distance away with a gun. Adams told him that it was not a thing to be played with, but the gun went off and a good many shots hit Adams in the face and arms, but only 8 or 9 had penetrated. None of the shots had penetrated Lamb. Heath said he was not aware that the gun was loaded, and the Bench believed it to be a pure accident. Heath was told he should compensate the girls. realy interested in this blog as m grandfather was born and raised next to the pier inn on a small holding and i remember him mentioning my great grandfather (Moses Barnard ) and his home from home ,the pub lol. 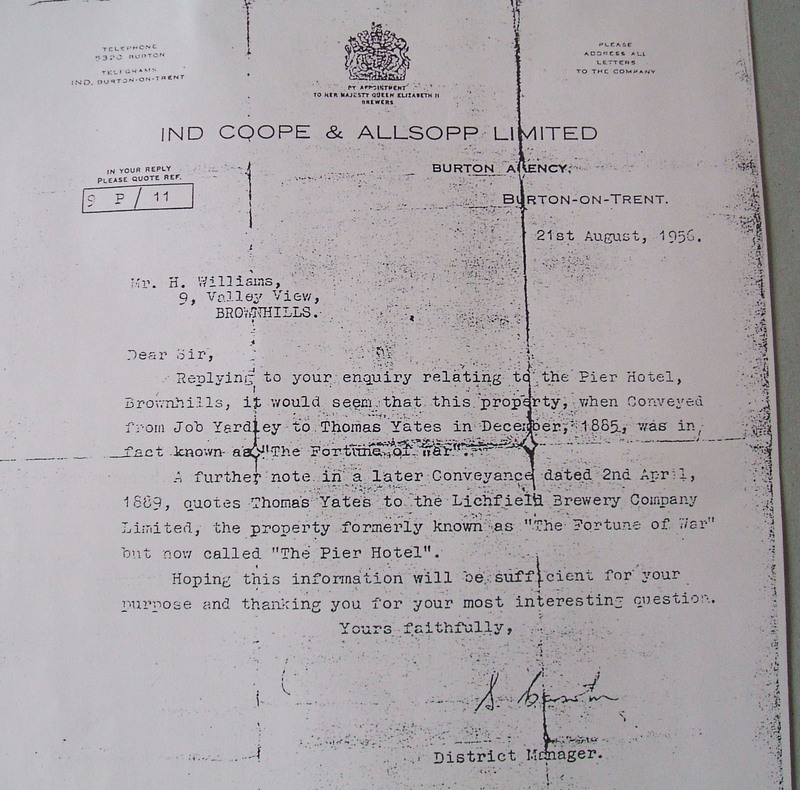 Inquest held T the Fortune of War inn on the death of Thomas Littler who worked at Coppice Colliery….Verdict Natural Causes. I am researching, among other things, my wife’s family history. Her great-grandmother, Mary Ann Rudge, is recorded in the 1871 Census as a Beerseller at the Fortune of War, Brownhills. The census record places this beershop in Walsall Wood (Piece 2967, Folio 81, page 39). If it really was in Walsall Wood, I guess it cannot be the same “Fortune of War”/”Pier Hotel” talked about in your blog: do you or any of your fellow bloggers have any information about this pub/beerhouse? Brownhills and Walsall Wood are so close, and the name so unusual, that it would have been the one mentioned. I’ve never seen reference to the Fortune of War in any other place than Brownhills, as above. Walsall Wood was awash with beer houses, but I never heard that name in relation to the village. I’m inclined to think it’s an error somewhere. David Evans David Oakley and the boy [Howmuch?] (amongst others, of course) are the real experts on The Wood. I’m sure they’ll have something to say. Hello John. I have had a look at the ledger recording beerhouse licences, and it lists the Fortune of War as being in the Parish of Walsall Wood, so you have the right pub mate. I dont know where the boundry is between Walsall Wood and Brownhills, but it is the same pub. Hope this is of use to you. 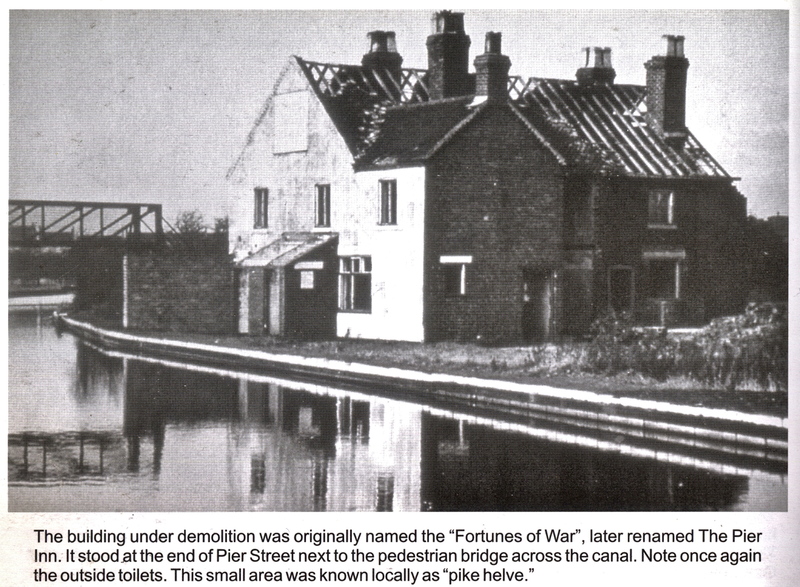 Sorry I should of stated there is only one Fortune of War, and its located in Pier St, Brownhills. Hello John. may have found out why the Fortune of War was listed as Walsall Wood, I`ve had a look at the records for licensee applications, and it as the pub listed as Walsall Wood, then its been crossed out at some time latter and replaced with the address Brownhills. Mary Ann Rudge, widow, beerseller, Fortune of War, aged 57, born Longton , Staffs, living with son John 18; sonCHarles aged 15 and daughter Sarah also 15. I have not found a pub of this name in Walsall Wood….but this entry does come under “Clayhanger” .. another part of Clayhanger shows Walsall Wood returns! I think there was only one Fortune..just by the canal in Brownhills and close to the footbridge. Quite a few Potteries miners migrated hereabouts….Look up Levi in the search box! 1911 summary census, Staffordshire,Walsall District 370, Aldridge sub district 4, enumeration district 14…i.e;- Walsall Wood, district 14 is interesting as this is the one that includes HIgh Street Brownhills, Silver Street, Brownhills, Pier Street Brownhills and some the western part of Walsall Wood..hence The Fortune of War public house seemingly appearing in “Walsall Wood”!